Green Bay - In a sport in which touchdown spikes, sack dances and camera poses are as common as the endorsements to which they may lead, Mark Tauscher wanted only one thing during his career with the Green Bay Packers. He wanted to be invisible. Anchoring the right tackle position for more than a decade, Tauscher's goal every Sunday was to remain as anonymous as possible, at the same time taking great pains to make sure the guy across from him remained so, too. Last Friday, the former University of Wisconsin player got the news that the Packers, unable to pass him on his physical because of a shoulder injury, were letting him go. 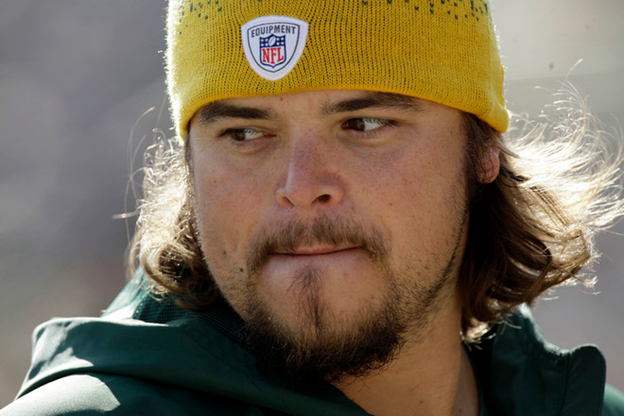 Just as quietly as Tauscher entered the NFL in 2000, his association with the Packers ended. The news came from general manager Ted Thompson, and Tauscher accepted it as the kind of business decision that happens every day in the National Football League. No hard feelings, no tears, no fanfare. If this is it, Tauscher has few regrets. "I think what I always wanted was to get the most out of my abilities and you knew when I went out there to play I was going to give everything I had," he said. "I feel like I can say that and sleep pretty well at night." In this state, Tauscher is as homegrown as dairy cows, cheese curds and tailgate parties. Born in Marshfield and a graduate of Auburndale High School, Tauscher progressed from walk-on to starter at UW before landing with the Packers. Among Wisconsin natives, only linebacker John Anderson (146) played more regular-season and playoff games for the Packers than Tauscher (134). Of those who played for both Wisconsin and the Packers, Tauscher ranks No. 1 in games played for the Packers. "The state of Wisconsin should be very proud of him," said former Packers general manager Ron Wolf, who drafted Tauscher in the seventh round in 2000. "He was dedicated to the game. He had a great desire to play. The game was important to him." Tauscher, 34, isn't completely sure that he's ready to call it quits. He's still working on strengthening the shoulder and hopes to be back to 100% fairly soon. Whether there's a team out there that wants him or one for which he wants to play will be determined later. Right now, Tauscher is helping tend to his infant son and thinking about whether he should put his master's degree in educational administration to use or even consider a job in coaching. "I'm just worried about what I can control and that's getting healthy and then trying to figure out what my next step is going to be, whether that's playing or not playing," he said. "I'll have to figure that out. "It really just comes back to how I'm feeling that's going to be the factor. How that plays out, I don't really know." Many fans want to know if there's a chance that Tauscher would return to the Packers when he's healthy, but there was no talk of that in his discussion with Thompson. The Packers are loaded with young linemen, and Thompson needs to find out whether they can play. Tauscher can certainly relate to that. A seventh-round draft choice in 2000, people gave him an ice cube's chance in hot coffee of making it past the first round of cuts. One guy who did give him a chance was Wolf, even though Tauscher had been a starter at Wisconsin for just one season. "They had all these other top guys, but once you went to a Wisconsin practice and watched the pre-drills you'd see his athletic ability," Wolf said. "They had these foot drills they did with soccer balls and he was phenomenal. "He had exceptional footwork and balance and strength." Tauscher lasted until the seventh round because he had a terrible looking body. He was wide and pudgy and poorly defined and that likely turned off a lot of scouts. But Wolf saw through that. Then the best thing that could have happened to Tauscher did when he arrived at Packers training camp in the summer of 2000. He was the only lineman signed to a contract for the three-day rookie pre-camp workouts. So while the other rookies worked in groups, Tauscher worked by himself with offensive line coach Larry Beightol. The one-on-one tutoring was perfect for the eager Tauscher, but even better because it allowed Beightol to see how much potential the rookie had. Tauscher knew he arrived when in a one-on-one blocking drill later in camp, he took enormously strong end Vonnie Holliday and threw him on the ground. "I laugh at Vonnie about this, that Vonnie helped me get my foot in the door," Tauscher said. "There was a lot of hooting and hollering and everybody was asking what's going on. That's when I thought, 'I can get this thing done.' "
Tauscher took over the right tackle starting job from Earl Dotson in Week 3 of his rookie season and became a fixture on the offensive line. He was so steady and reliable that players used to go up to his teammates after games and say, 'I can't believe I couldn't beat that guy.' "
He was reliable and so technically sound that he did not commit a holding penalty until his seventh season. Among the players he had frustrated over the years were Reggie White, Julius Peppers, Michael Strahan, DeMarcus Ware and Jevon Kearse. "You try to be as invisible." Tauscher said. "You want to do everything well, but in the grand scheme of things, if you don't give up sacks and pressures and don't get penalized you're going to be a pretty successful player. "And you show up. I had a (57)-game streak, those are things you take a lot of pride in, not being penalized and being able to be counted on." If Tauscher doesn't play another snap, he'll have more than made his mark in Green Bay and certainly with the Super Bowl XLV team even though he spent the last 16 games on injured reserve. Coach Mike McCarthy asked Tauscher to hang around so he could lend his expertise to the offensive line and keep everyone loose as he always had done. Tauscher agreed and attended Friday and Saturday meetings. "From what I know, the guy hasn't changed from the moment he got here to the moment he left," said Tauscher's successor, first-round pick Bryan Bulaga. "That speaks volumes about him. When the rookies came in my class, he was a great guy to us. "You just saw the type of person he was. That's how I remember him, how helpful he was and his humor." Tauscher, who served as the team's union rep, won't be along for the ride when the Packers go to the White House, which is a disappointment given his interest in politics. But he said it's enough to have the big, gaudy Super Bowl ring the club gave out in June to remind him of everything he accomplished. "I completely understand it and I'm not the least bit upset about it," he said. "You have to be able to roll with the punches, and I think it will be a great time for those guys."